RebelMouse provides social publishing tools that enables clients to create digital hubs of original and community content and to execute content-driven marketing campaigns. RebelMouse provides social publishing tools that enable clients to easily create dynamic digital hubs of original and community content and to execute content-driven marketing campaigns. Content can be aggregated and published to any site, including all major social networks. Content can also be turned into a real-time, ad-served banner or embeddable content. Readers can create personalized content streams and receive mobile notifications when the material is liked, commented on, created by friends, or when anyone contributes content on topics of interest. Additional features include second-screen activation, automated social notifications and sharing tools, and in-depth analytics. The site and streams are available in native mobile apps for iOS and Android. Starts at $10,000 per month. A free personal version is available. Scott Omelianuk, editor for Time Inc. subsidiary This Old House Ventures and editorial lead for The Snug, has been using RebelMouse since December 2014. RebelMouse is the platform on which The Snug lives. 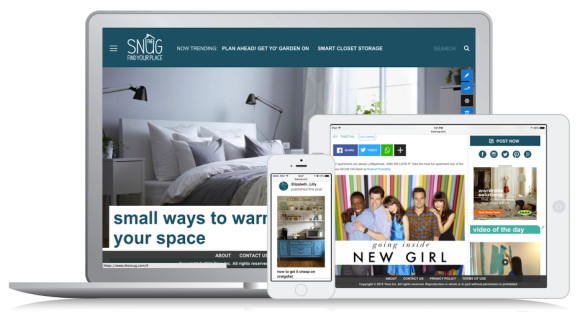 The Snug is primarily a curated site that aggregates the best core online DIY home content – including partner content from Time Inc., content from external partners such as Hometalk and Refinery29, and consumer-generated content. We plan to include original content as well. The site is a social CMS, so anyone who would like to contribute can join, create a page, and upload content. Then our editors look at it and decide what’s going on the site and where. They also decide what they’re going to amplify on social media channels. RebelMouse has a built-in social media module that automatically pulls in posts with particular hashtags. This lets our audience participate in the conversation and keeps the site fresh. The team built the infrastructure for The Snug and gave us a handful of training sessions. They have a couple of templates and we provided Photoshop documents of design requirements, including logos, typefaces, color schemes, and more. The turnaround time was a matter of weeks. The platform is simple to use. The ability to build a post on RebelMouse is very easy. And you can pull in content just by using URLs and clicking and dragging. RebelMouse’s team is really responsive when we need infrastructure changes. If we have a functionality issue, our project manager at RebelMouse farms it out to the appropriate support person there. Sometimes an issue will bounce back to us. For example, if the issue were a matter incompatibility within ad serving it would come back to us. RebelMouse’s platform allows for a speed and agility in building out a new Web presence that most companies would find hard to do because there are so many other priorities. Because the process is so agile, it allows us to compete with anybody. We know Millennials respond well to our content when it’s shown to them, but they weren’t necessarily engaging with the platforms we had. So communicating with that consumer on his or her own terms was really important. We’re presenting content in a voice that the Millennial audience is comfortable with, so we use headlines, a lot of GIFs, and other images on The Snug that we wouldn’t necessarily use in a traditional Time Inc. publication. RebelMouse’s dashboard includes A/B testing, which is really helpful in determining which headlines and other content elements resonate with the audience. Ikea is The Snug’s launch partner. The company is deeply involved in native content and content marketing. The Snug provides a great opportunity for us to deliver Ikea messaging to Millennials and for the brand to reach them. It’s our dream that The Snug will be the first in a family of sites for Millennials. RebelMouse’s platform will make it easy for us to roll out new sites and cross-pollinate content between the sites. The speed with which we can roll out those sites and be responsive to advertisers that are interested in those vertical markets makes RebelMouse ideal for us. RebelMouse built the interface and hosts the site. We built an exciting, compelling site in less than six weeks. The turnaround time would have been faster if we hadn’t needed as much customization. Given my experience in prior Web launches, that’s pretty remarkable. There’s the opportunity to grow new brands. As important as the legacy brands might be, a platform like RebelMouse allows us to try new brands at a low cost and see if they take off. RebelMouse was built with native advertising or native content posts in mind. In the era of banner blindness, having native built into the system is nice. The platform is completely responsive and mobile first, which makes a lot of sense for the Millennial audience. There are no insurmountable drawbacks. With out-of the-box functionality, things exist for everyone who is using the platform so some functions might not be useful to you. You either have to get used to them or spend the extra time and money to customize. For us, improvements are a matter of ongoing customization. Adobe Experience Manager: A platform for creating, managing, and optimizing content across multiple digital channels, including the Web, mobile apps, digital forms, and communities. WordPress.com VIP: A premium Web-publishing service designed for enterprise companies. It includes all of the features of WordPress.com plus the ability to run custom code, a robust content management system, and 24/7 support. Additional products and services, including site and security monitoring, content monitoring, and developer training, are available. Drupal: An open source customizable content management system that allows users to easily organize, manage, and publish content.